Year’s end is a very busy time for the Irish Specimen Fish Committee with the finalisation of specimen fish claims and production of the annual report. PETER GREEN, Sea Angling Advisor with the Central Fisheries Board, relates how sea angling charter skippers contribute so much to the work of logging specimens, ongoing monitoring of fish migrations through a marine fish tagging programme and recording of specific information on deep sea angling effort for the season. Some anglers may not be aware that the majority of specimen fish caught in salt water are taken on deep-sea charter vessels. Central to the process of successfully logging of specimens, particularly for our overseas visitors, is the charter skipper. Possessing a wealth of angling knowledge and experience the skipper is first on the boat to recognise a specimen fish when he/she sees one. Although UK international angler Steve Quinn didn’t need any help in recognising his unusual catch the skipper was on hand to take the photo. After an angler has boated his specimen, his part has been completed apart from filling in his particulars on the claim form, a vital document which the skipper always has a supply on hand. The remainder of the process to complete and finalise the claim falls to the skipper. 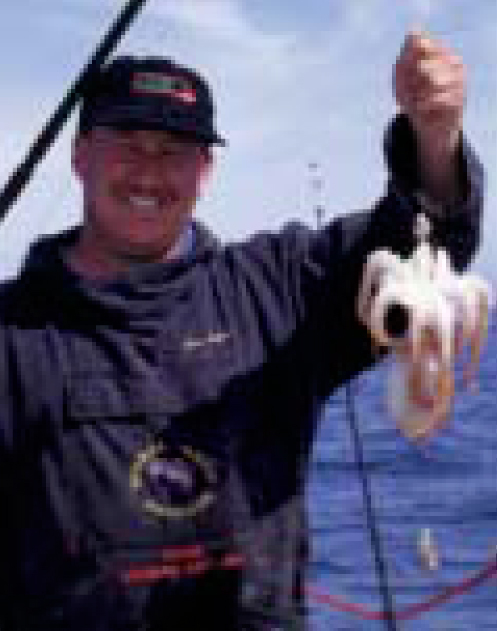 This follow through is particularly important for many of our overseas, anglers who may be on their first trip to Ireland and are totally dependant on the skipper to guide them to a successful outcome. For example this year, Mark Gannon’s boats “Lady Louise” and “Lady Patricia” based in Courtmacsherry recorded 31 specimens and 2 Irish Records with the majority taken by Dutch anglers. Apart from specimen fish, many skippers have, over the past 28 years, taken part in the Central Fisheries Board Marine Tagging Programme whereby all shark, tope, monkfish, common skate and ray are measured, tagged and released. This programme is executed on a voluntary basis and is an ongoing study of the migration patterns of these sport fish. A short paper presenting some of the results titled “Results from tagging of Blue Shark in Irish waters” by Paddy Fitzmaurice and myself has just been published in The Irish Scientist 2000. Skippers also keep angling logbooks or diaries, which record such details, as numbers of different species, average weights, nationality of anglers and all other relevant data which are useful indicators of angling market trends. Part of my job entails visiting all of the angling centres from Wexford to Malin in North Donegal every autumn to collect the results of the year’s charter boat activity. Tags, bags, boxes, papers, books and lots of stories are collected over this period. In addition, I also collect fish bodies which have been stored by the skippers and are required by the Specimen Fish Committee for positive species identification by their biologists. Identification is particularly important to ensure that the ISFC has an accurate account of species taken. One suppose one can count myself lucky that no one has presented me with an angler fish (specimen weight 40 lbs) yet! This system can have its very own drawbacks, as I will illustrate. I go prepared with a few cooler boxes and hope not to have too many bodies on the first night as this entails a daily transfer of fish into and out of guesthouse freezers as I continue my journey around the coast. I have spent many a night in November in an outhouse or garage armed with a torch and knee deep in chickens and Sunday roasts looking for some unfortunate rockling which is at the bottom of the chest freezer, having been put their five months previously. Once I have received a fish from the skipper the onus is on me to deliver it safely to Dublin. In that context remembering to remove the fish from the freezer each morning is important! This collecting job is not for someone who has a tendency to be car sick. Here’s why quite often fish are not frozen until after the decay process has started. Thawing out each day can create dreadful obnoxious odours which permeate the car and only serves to boost the sale of air fresheners. In one particular guesthouse, having convinced the landlady that the fish were not alive, she rebagged them in case they contaminated the contents of her freezer. She handed me the bag in the morning containing the five fish. On arrival in Dublin, 1 discovered to my horror that the cuckoo wrasse was missing and in its place 1 had three fine pork chops. Luckily, I was able to rectify the problem immediately and no one was any the wiser until now! To-date, charter skippers have been responsible for tagging and releasing over 31,000 fish which includes 16,000 Blue Shark. A total of 74 skippers keep an?ling logbooks. The logbook programme is in its 23rd year and a national statistic sheet is produced each year. Finally, none of these activities would be possible without the dedicated voluntary cooperation of the 80 charter skippers around the coastline. I know that the Central Fisheries Board and the Irish Specimen Fish Committee wish to express, a deep and sincere word of gratitude for all their efforts. ← Maybe we’ll stay at home this year!